Three hounds lost their lives this past weekend after wolves attacked and killed them. A group of mountain lion hunters were out with their four hunting dogs at the Nine Mile draingage, near the old school house,or what is known as the Nine Mile Community Center, this past weekend, when their dogs were hot on a mountain lion’s trail. They were devastated when they discovered three of their dogs had been poached by wolves. The group was expecting to find a treed cat when they caught up to their beloved hounds but, instead, found the dogs “lying there lifeless in the snow”. The fourth hound managed to escape and was later found hiding. 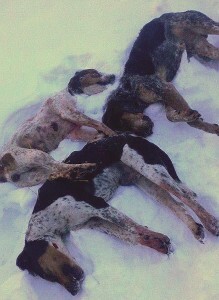 These dogs were victims of sport killing–which is very common with wolves. The hunters packed their three dogs back two miles to their truck after the incident. “Just to let everyone know, we have been running all the roads, and there has been NO wolf sign at all. Since the first of December. We have seen two elk tracks and the wolves have literally killed everything off so there is no food. It sounds like reports we are getting is that they had moved over on the reservation side, but for some reason they were travelling today and ran right into our dogs. Whether you are out hunting with dogs or just walking your dogs, please be aware that there are wolves out there, whether you see wolf sign or not. As their population continues to grow, so does “their” territory. For more information on Montana’s wolf hunting and trapping season, check out the Montana Fish, Wildlife & Park website: http://fwp.mt.gov/hunting/planahunt/huntingGuides/wolf/default.html.